The American Consumer Satisfaction Index (ACSI) has released its 2014 annual report on consumer satisfaction the telecommunications and information sectors, and one finding will surprise no one: Americans are increasingly unhappy with their cable companies and Internet service providers. How unhappy? 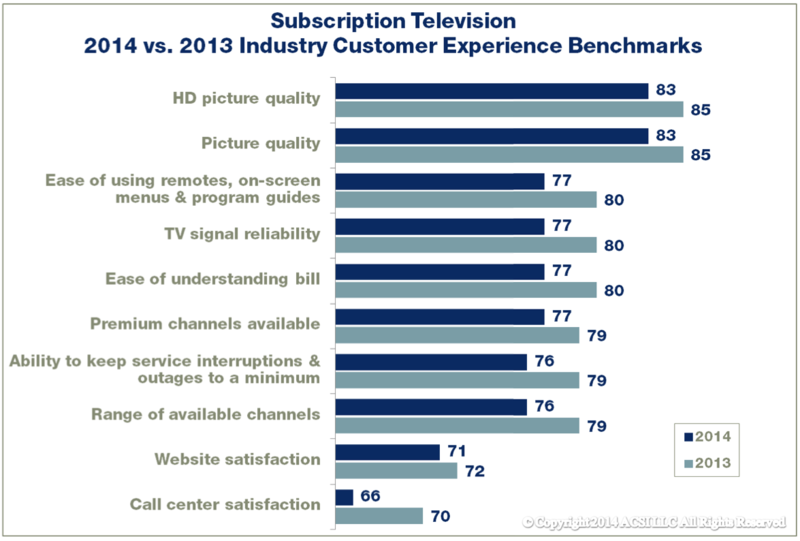 Subscription television services and ISPs now rank at the rock bottom of the 43 industries covered by the ACSI, with customer satisfaction levels even lower than airlines and (yup) social media. But the report also has some surprises: Samsung is now the leader in smartphone satisfaction (knocking Apple down to number two). And the telecommunications service with the highest satisfaction rating? Old-school wireline voice service. What do the ACSI’s latest satisfaction numbers tell us? And what do the figures mean for high-profile mergers like Comcast and Time Warner Cable, or AT&T and DirecTV? The ACSI is one of the longest-running consumer research studies in the United States. Sure, lots of other companies survey consumers about what they like and don’t like, but the ACSI has been at it for two decades, and surveys 70,000 consumers a year on a variety of topics. That’s an enormous amount of consistent data, and means the ACSI is a great way to look at consumer satisfaction over a long period of time as companies (and entire industries) shift, struggle, and adapt. Subscription television services and Internet service providers are now lower than any other industry. The ACSI’s rankings for companies boil down to a customer satisfaction score from 0 to 100: the higher the score, the most consumers are satisfied with aspects of the company’s products and services. The ACSI also ranks customer satisfaction with aspects of a business, like customer support, variety of products, and cost. And guess what? Most companies in the information and telecommunications sectors would love a 79. 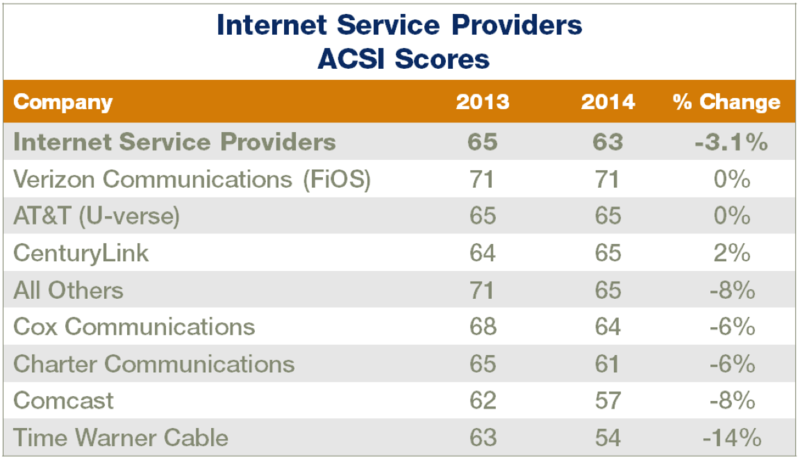 Americans’ satisfaction with subscription television services and Internet service providers are now lower than any other industry tracked by the ACSI, with cable companies averaging a satisfaction score of 65, and ISPs coming in even lower with a 63. Every television service saw its score decline from 2013, with AT&T U-verse and Cox Communications suffering only 3 percent drops, but with Verizon FiOS and Time Warner Cable dropping 7 percent year-on-year. Satisfaction fell in every measure, although consumers are still pretty happy with overall picture quality, with the industry scoring an 83 for both standard and HD content. The biggest drop came in call center satisfaction, with the industry score dropping from 70 to 66 in just one year. ISPs were a little more mixed: CenturyLink actually managed a 2 percent improvement from 2013, although that only means its current score is a 65. Otherwise, AT&T U-verse and Verizon FiOS managed to hold their ground at scores of 65 and 71, respectively: and that 71 puts FiOS six points ahead of anyone else in the business. Lowest of the low? Time-Warner Cable, which dropped 9 points this year to a score of 54. Next lowest? Comcast, which dropped 5 points to 57 this year. Things could get worse. The pending Comcast and Time Warner merger doesn’t bode well for customer satisfaction. The ACSI’s long-term data shows that mergers in service industries tend to harm customer satisfaction, at least initially. Customer satisfaction is a mixed bag for mobile operators who altogether held steady at a combined score of 72 – same as they got in 2013. However, there is motion in the ranks: Sprint and AT&T registered drops compared to last year (both down to 68), while T-Mobile managed a one point increase to 69, and Verizon jumped two points, putting it far in front with a 75. However, “all other” carriers – meaning anyone but the big four – maintained a combined customer satisfaction rating of 78. Overall satisfaction with data speeds and reliability jumped 3 points to a 75 compared to last year, but that still puts data service towards the bottom of customer experience benchmarks. 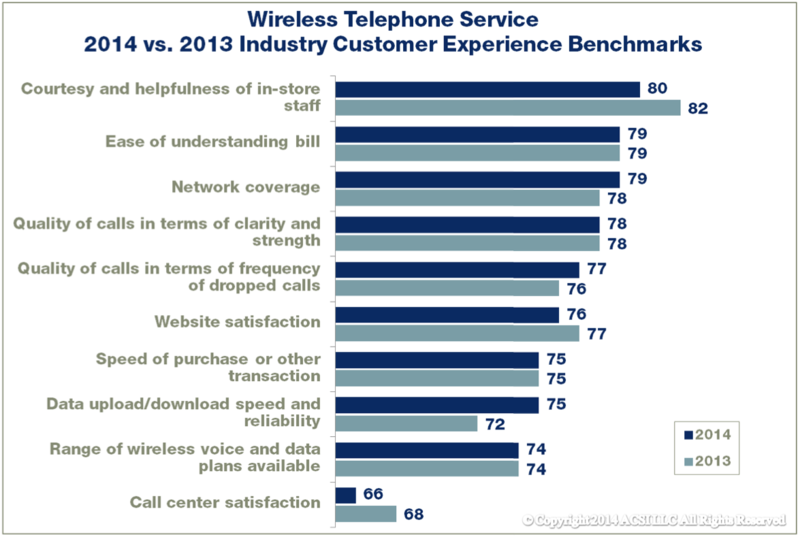 Call center satisfaction dropped 2 points to a 66, and despite a range of new calling and upgrade plans from all the major carriers, customers are no happier with mobile plans in 2014 than they were in 2013. What about the smartphone wars? Apple has long been vaunted for its high customer satisfaction rates, but Apple lost two points this year, dropping from an 81 to a 79 – making it the only phone maker to see a satisfaction drop compared to 2013. And who picked up 5 points? Samsung, which jumped from a 76 in 2013 to an industry-leading score of 81 for 2014. Motorola and Nokia tied for third place with scores of 77 – that’s holding steady for Motorola, and a slight uptick for Nokia compared to 2013. 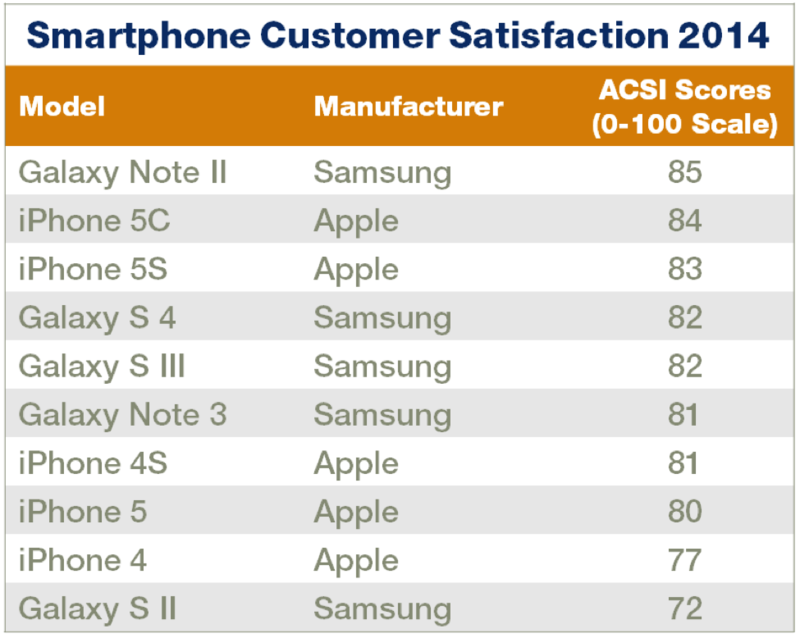 According to the ACSI, the older Galaxy Note II delivered the highest customer satisfaction in the smartphone field, scoring an 85. Apple’s iPhone 5S and 5C took the second and third slots, with Samsung’s S4 and S II rounding out the top five. (The Galaxy S5 wasn’t released in time to be included.) Together, Samsung and Apple kept every other phone maker out of the top ten. You know that thing we all love to hate, wireline phone service? 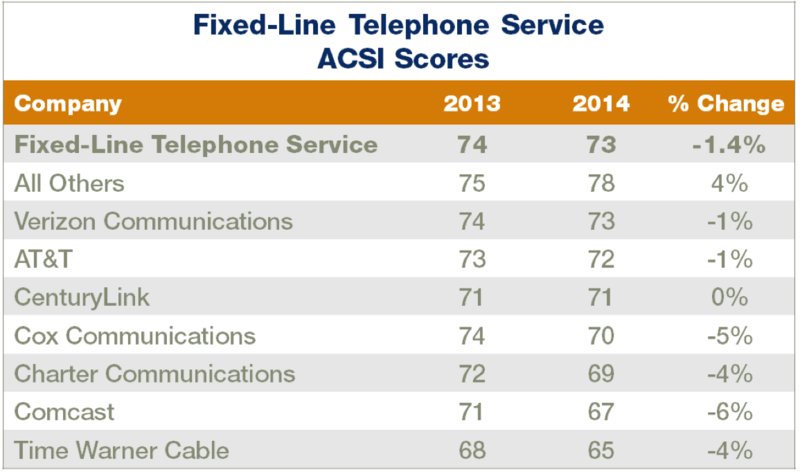 Although overall satisfaction with wireline service dropped about 1.4 percent compared to 2013, old-school landlines have a higher satisfaction rate than any other consumer telecommunications service, managing an overall score of 73. And the whole category is being largely dragged down by (you guessed it!) voice services offered by cable companies, which saw three- and four-point drops in 2014 compared to 2013. Comcast dropped the most year-on-year to a 67, but Time-Warner is still even lower with a score of 65. Right now, about 40 percent of American households have cancelled landline services entirely in favor of mobile – and, oddly, that may mean happier landline customers. It might be easy to dismiss the ACSI’s customer satisfaction rankings as “just a number” – and we’re sure a few companies will do just that when they see these results. But the ACSI’s consistent, long-term approach to measuring customer satisfaction across broad segments of the U.S. economy give these mere numbers more weight than some efforts that pass at customer research these days. This isn’t some quicky online poll or a casual analysis of usage traffic on an advertising network accompanied by a press release: it’s consistent, well-crafted surveying from a company that does nothing but measure consumer satisfaction, all year round. And any of you who see things getting better with a Comcast/Time Warner merger might want to get your glasses checked.